Before I get going, you should probably be made aware that Suffield’s Sunrise Park is for Suffield residents only. You should also probably know that I am not a Suffield resident. And yet, here we are. 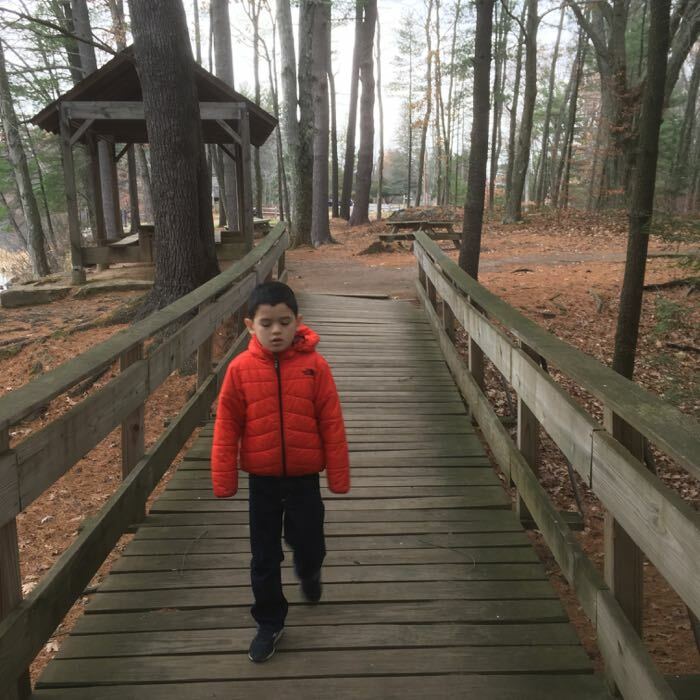 Hiking in Sunrise Park in Suffield. I am an unrepentant rebel! There is a park ranger’s office, but I never saw the park ranger. 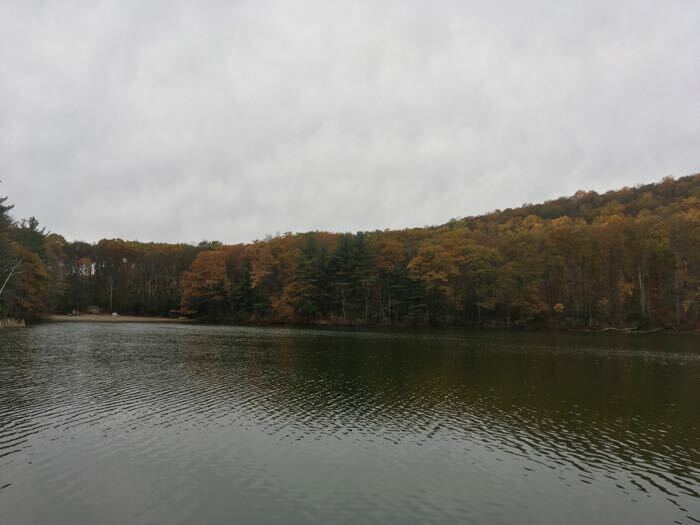 And here’s the funny part… I visited here on 3 separate occasions in order to simply hike around the dang pond. My first was to gather intel. How easy was it to gain access to the place? Are there armed guards? Snipers? Trained rabid raccoons? Was there a trail map to assist my covert operation? Did parked cars have secret Suffield stickers? Did I see any secret Suffield handshakes as people passed each other? Annnnd… there was one car parked but the person was nowhere to be found. The road is a single loop around – meaning that once you’ve crossed the threshold into the park, there’s really only one way out. And that way is easily blocked by a ranger’s truck… dooming trespassers to a lifetime of hard labor. I had to think long and hard about this one. Was it worth it? I returned in December. My plan was thus: bring six-year-old child with me. No way would the cops and/or park rangers throw me in the clink with Calvin’s teary doe-eyes looking up at them. And, my thinking went, no way would a responsible father put his loving child in harms way knowingly. Let me go with a slap of the wrist, please and thank you. As we began walking across the frozen beach, Calvin alerted me to his nausea and general unease. We had just driven 40 minutes to Sunrise Dang Park in Suffield for… nothing. Not one to push my dear child when he’s ill, we turned around and drove home. (This, by the way, was the beginning of our discovery that Calvin gets motion sickness while reading in cars. Which stinks. But that’s what this was before we realized it was a thing that happens to him. 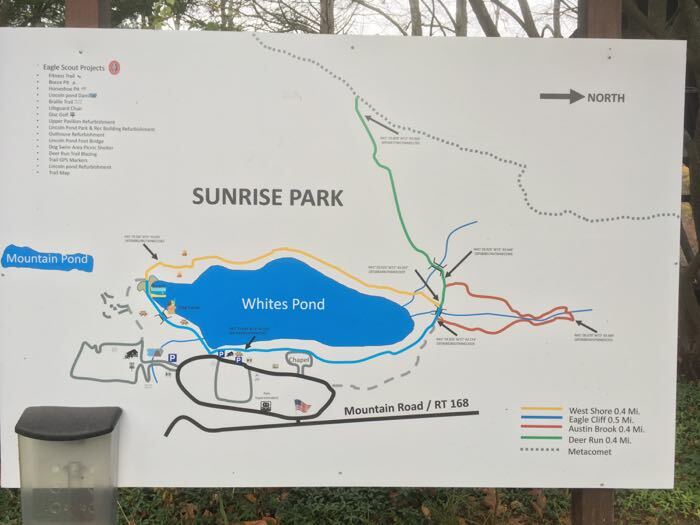 Joking aside, I certainly didn’t expect Sunrise Park to require three separate visits, so many months apart. When I visited my final time, on a hot summer day, I was determined to hike this place to completion. And, still putting jokes aside, the whole thing about this being a Suffield-only spot was a bit silly to me, because according to all maps at my disposal, the open-to-everyone Metacomet Trail up on West Suffield Mountain across the pond is linked to Sunset Park via a Green-blazed trail, as seen on the map above. So really, my line of thinking went, I could hike here coming down from the Metacomet without issue. 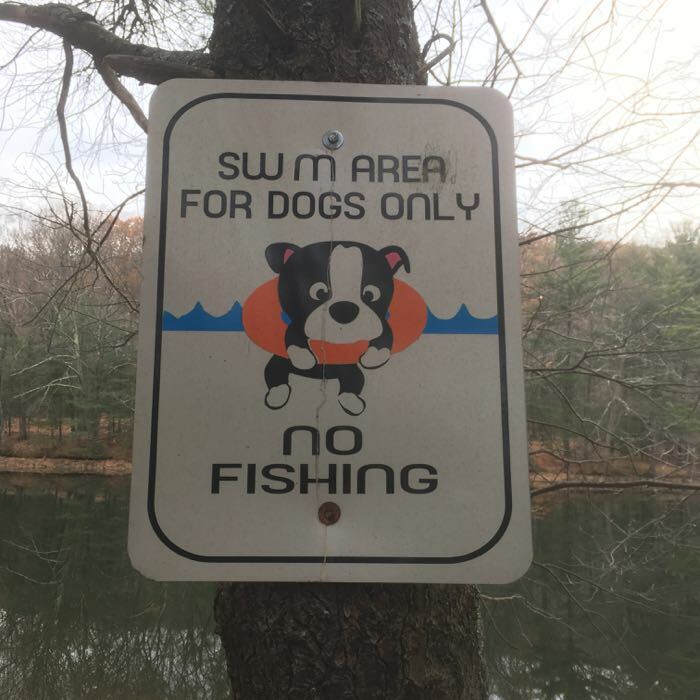 I’m not using any facilities or swimming, so I’d be fine. I parked and exited my car like I belonged there. How does one look sufficiently Suffield? I don’t know. Enough of that. Let’s walk! I circled the pond, called White’s Pond, by the way, counter-clockwise. Through the hemlock grove and past the buildings that I assume summer camps use. 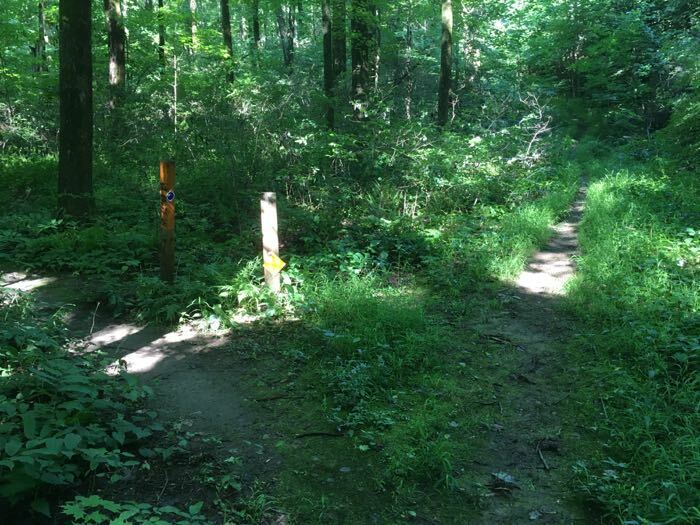 From there, the trail is clearly less traveled and was a bit overgrown in the summer. Not an issue at all though. So I began walking it. I wanted to prove to myself that that it did, indeed, connect. 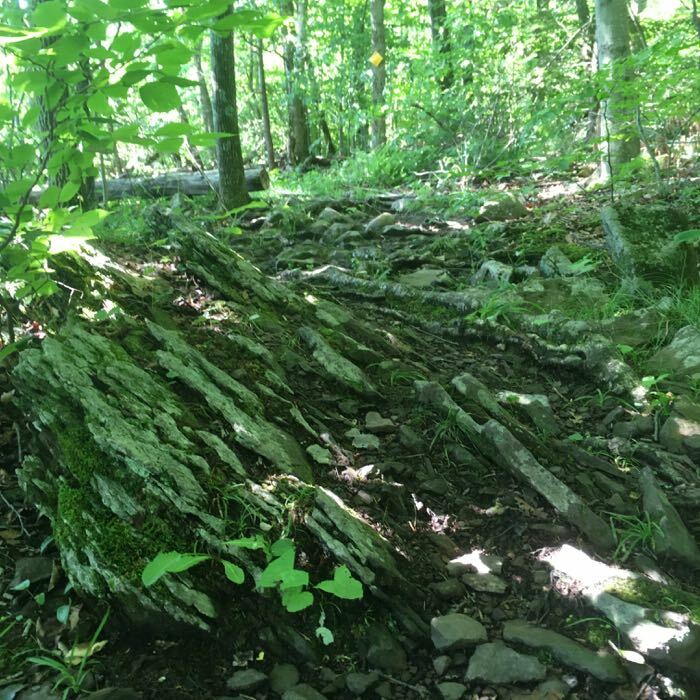 (A prior hike along the ridgeline Metacomet searching for it proved fruitless.) However, after a minute or so, the trail completely peters out. Just disappears in the underbrush. Sure, I could have just bushwhacked up the hill, but what would have been the point? The connector trail simply doesn’t exist anymore, in any meaningful way. The trail around the pond affords several nice little look-sees across its expanse. Suffield does not lack for decent outdoor areas, and Sunrise Park certainly adds to the town’s rural appeal. 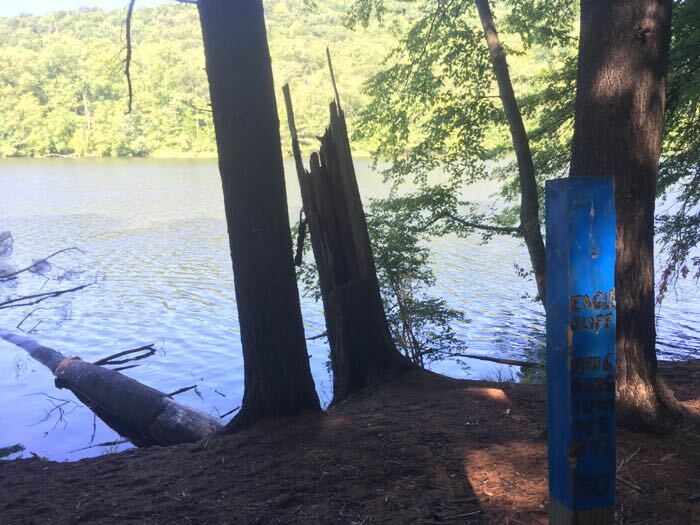 And again, the main trail around the pond isn’t exactly the greatest trail in the state… or even the town… or even in the West Suffield Mountain area (that prize goes to the Metacomet, obviously)… but it’s still worth – actually, nah. It’s not really worth checking out. Especially since you’re very most likely not a Suffieldian and I don’t want to promote any sort of rule-breaking here. 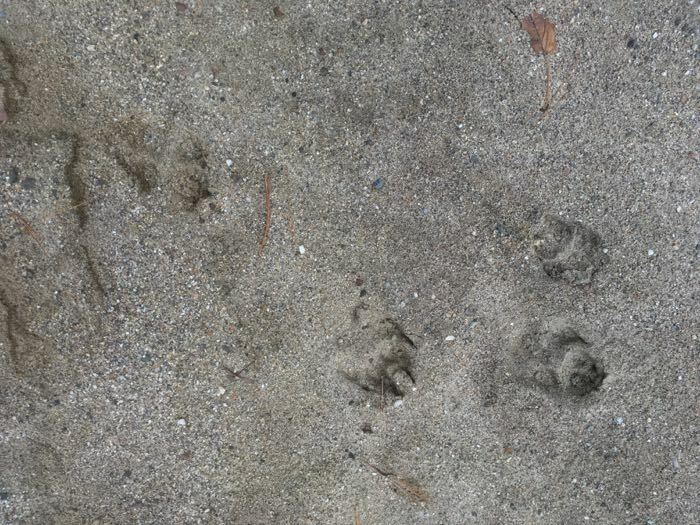 As I made my way back around towards my illegally parked car, I passed the beach area where Calvin and I turned tail so many moons ago. There was a lifeguard on duty and some sort of training program for teens out on the floating dock. Hoo boy, what would they make of me, the interloper? Turns out, nothing. At all. They never even looked at me. I was just some weird guy emerging from the woods. 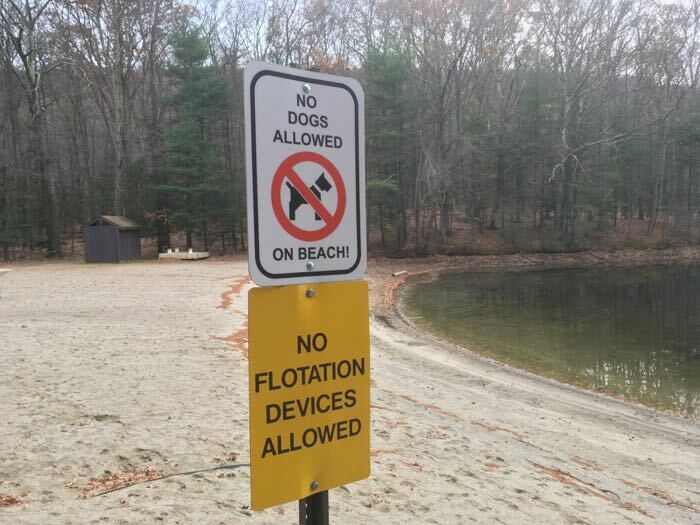 I was at least smart enough not to take a picture of the teens in bikinis and speedos. Could you imagine if I did and that spurred an investigation by the ranger/police as to why this non-Suffieldian was traipsing in their townie-only park? 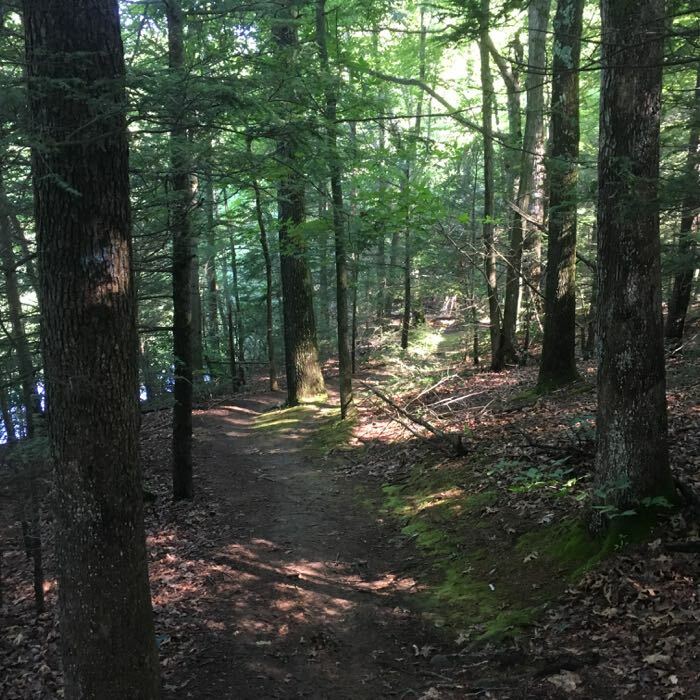 Discovering Suffield a la CTMQ was a most interesting experience for this long-term Suffieldian, who has had the pleasure of walking most of the trails in town, though not so much recently. (I have mixed feelings about my unfortunately superannuated corporal entity.) 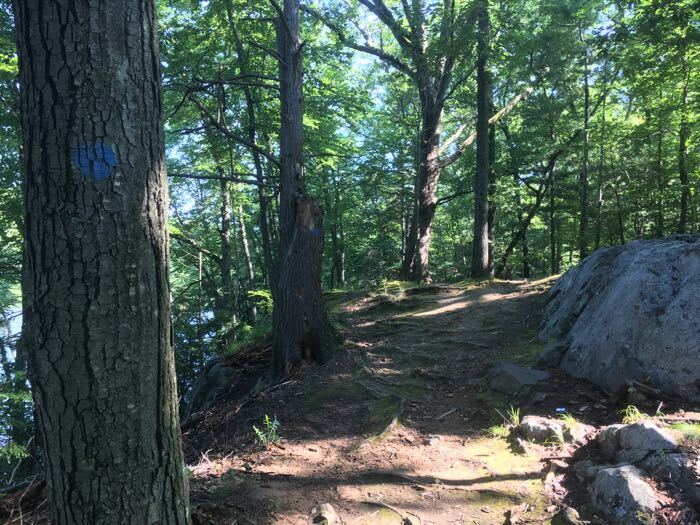 As one who first mapped the trails in all three parks – back in the ’70s – I’m familiar with the features you spoke of harshly as well as the many favorable opportunities we lucky Suffieldians can legally enjoy. 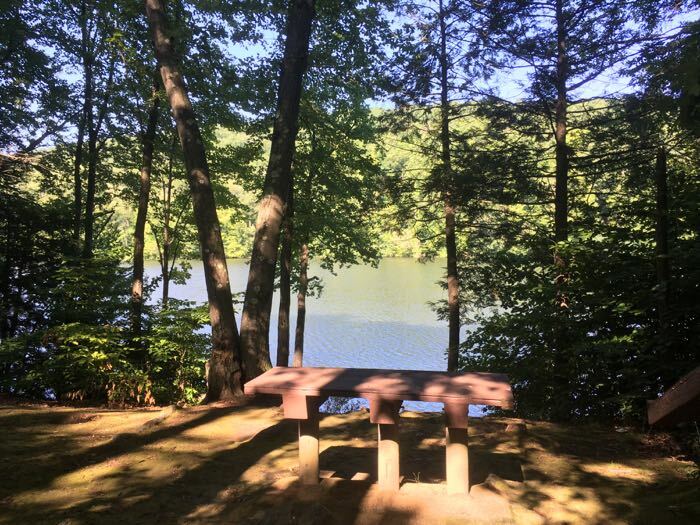 A few comments: That swimming hole on the brook next to that relic of an impromptu bench was, and sometimes is, called “White Iron.” I’d love to know the source of that odd moniker. 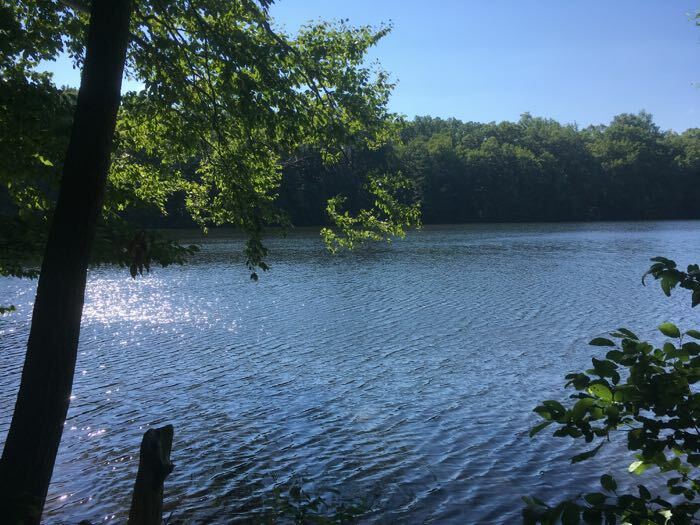 The Stony Brooke name comes from the brook that crosses the southern end of the park and flows under the railroad trestle at White Iron., just past the confluence with Muddy Brook, which forms the park’s eastern boundary. The “e” at the end of the park’s name was required by the park’s donor in his deed of gift adout fifty years ago. 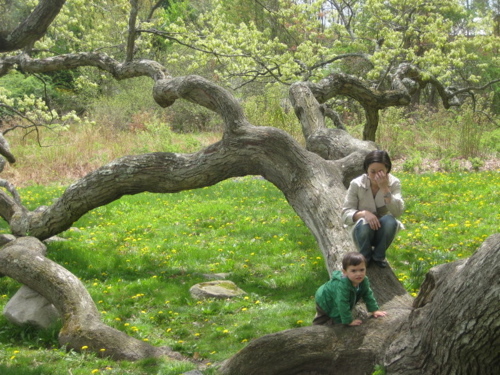 The little Jesse Smith Town Forest was once the woodlot of the Town Farm a.k.a. the Town Poor Farm. 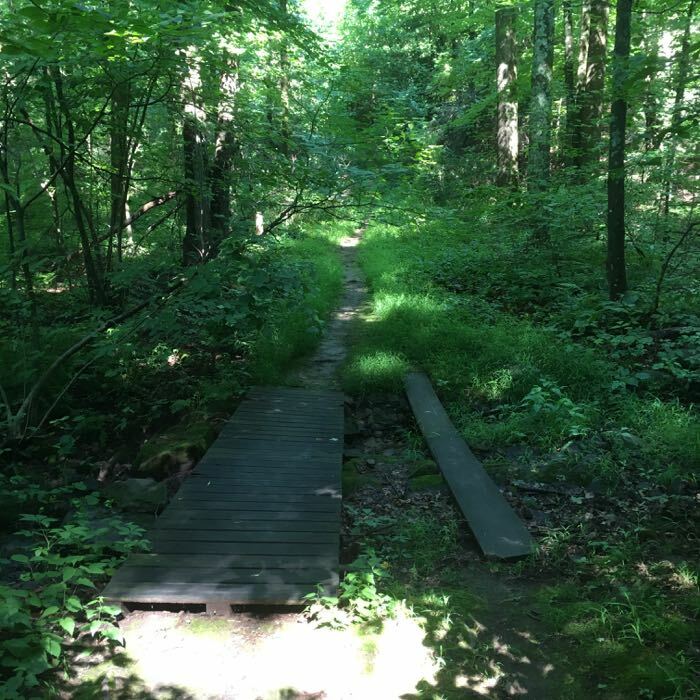 When financially-handicapped oldsters were no longer housed in poor farms, the farm fields and house were sold, and the woodlot was eventually named in honor of the beloved minister-teacher-naturalist who first cleared the Metacomet Trail’s northernmost segment. 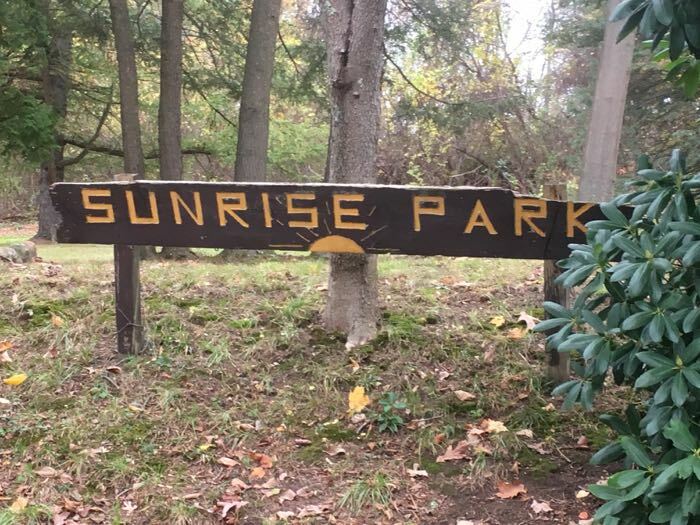 As for Sunrise Park, many of whose features were donated or created by volunteer effort, the town held a contest for its name, early on, and my proposal, with tongue in cheek, was “Poison Ivy Park.” Happily the better name won. 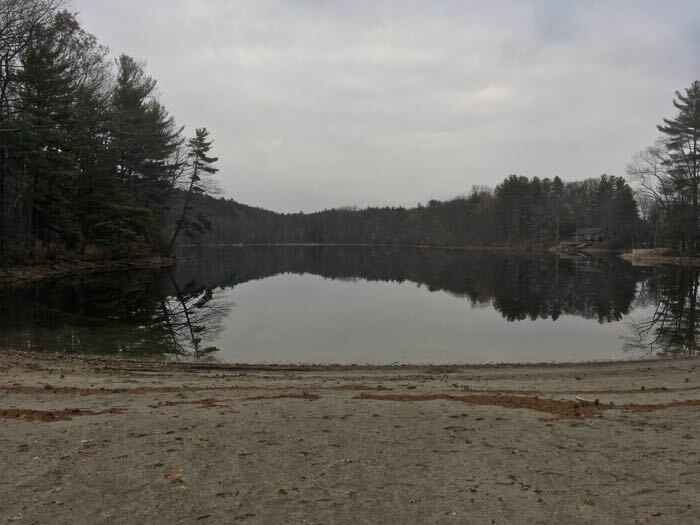 The dam and pond were created by the former owner, copying an 1890s plan for the town’s first municipal water system that was ignored in favor of deep wells near the town center.. Enough, already. I tend to ramble.